By morning, three newborns were already dead. The day had begun with the usual hazards: chronic shortages of antibiotics, intravenous solutions, even food. Then a blackout swept over the city, shutting down the respirators in the maternity ward. Doctors kept ailing infants alive by pumping air into their lungs by hand for hours. By nightfall, four more newborns had died… The economic crisis in this country has exploded into a public health emergency, claiming the lives of untold numbers of Venezuelans.I start with these rather long quotations with a heavy heart. Contrary to Sirota’s glib prediction, I do not intend to laugh off as “harmless and forgettable” Venezuela’s “cautionary tale about the perils of command economics.” I do not find dying children laughable. But then, I did not laugh when I read about starving Ukrainians eating their children during Stalin’s Holodomor. I did not laugh when I read of Khmer Rouge soldiers shooting infants off their bayonets in communist Cambodia. And I certainly did not laugh when I saw with my own two eyes children reduced to starvation by the Marxist dictator of Zimbabwe, Robert Mugabe. In fact, there is nothing laughable about the almost incomprehensible degree of suffering that socialism has heaped upon humanity wherever it’s been tried. 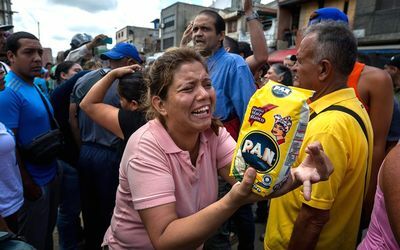 As much as I would like to enjoy rubbing Sirota’s nose in his own mind-bending stupidity, I cannot rejoice for I know that Venezuela’s descent into chaos – hyperinflation, empty shops, out-of-control violence and the collapse of basic public services – will not be the last time we hear of a collapsing socialist economy. Looking into the future, it is safe to predict that more countries will refuse to learn from history and give socialism “a go”. And, I am equally certain that there will be, to use Lenin’s words, “useful idiots,” like David Sirota, who will sing socialism’s praises until the moment when the last light goes out and time comes for them to move on and find something else to write about. And that begs an important question: considering that socialism has failed wherever it has been tried, why do we persist in trying to make it work? Evolutionary psychology provides one plausible answer. According to Professors John Tooby and Leda Cosmides of the University of California, Santa Barbara, human minds evolved in the so-called “Environment of Evolutionary Adaptedness” between 1.6 million and 10,000 years ago. “The key to understanding how the modern mind works,” Cosmides writes, “is to realize that its circuits were not designed to solve the day-to-day problems of a modern [humans] – they were designed to solve the day-to-day problems of our hunter-gatherer ancestors.” In other words, modern skulls house Stone Age minds. So what are some of the characteristics of these Stone Age minds and what do these characteristics tell us about the way we understand economics? First, we evolved in small groups. We knew each other and were, probably, related to each other. In a world without specialization and trade, gains by one group, “us,” tended to come at the expense of another group, “them.” That makes it difficult for us to understand and appreciate gains from complex economic activities, such as global trade. Second, like many other animals, we have evolved to form hierarchies of dominance. And, like other animals, we resent those at the top and form coalitions to displace them. Our resentment of hierarchies includes not only zero-sum hierarchies, like dictatorships, which channel resources to the top, but also positive-sum hierarchies, like corporations, which improve human lives. Third, the “social nature of hunting and gathering, the fact that food spoiled quickly, and the utter absence of privacy,” Will Wilkinson writes, meant that “the benefits of individual success in hunting or foraging could not be easily internalized by the individual, and were expected to be shared. Envy of the disproportionately wealthy may have helped … those of lower status on the dominance hierarchy guard against further predation by those able to amass power.”Put differently, humans are, by nature, envious, resentful and unable to comprehend, let alone appreciate, a sophisticated economic system that has evolved in spite of, not because of, our best efforts. For these and other reasons, people like Sirota wax lyrical about Venezuela, while ignoring examples of true success in the global economy. Chile is one such example. In the 1970s, Chile switched from socialism to free markets and thrived. In 1973, which was the last year of socialist rule, average per capita income in Chile was 37 percent that of Venezuela. By 2015, Venezuela’s average per capita income was 73 percent that of Chile. The Chilean economy has expanded by 231 percent. Venezuela’s has contracted by 12 percent. With any luck, Nicolas Maduro, Chavez’s successor will soon be gone, and the people of Venezuela will be able to fix their broken country. They should look to Chile as an example to follow.